These mirrors, made in the manner of Thomas Chippendale - lot 100 - recently went under the hammer and surpassed all expectations when they sold for a mammoth Â£80,500. The guide price on this lot was Â£25,000-35,000, which goes to show that these mirrors are much sought after, and for good reason. Taking a closer look at the pieces, you can see the pierced cartouche crestings surmounted by acanthus foliage, with each flanked by a pair of ho-ho birds. The oval plates are set within elaborate rocaille frames with leaf scroll, flower and C-scroll ornament and are headed by 'icicles'. The mirrors have been re-gilded and the carved elements restored. A pair of mirrors of closely related form but surmounted by chinoiserie busts, were supplied by Thomas Chippendale in 1759 to the fifth Earl of Dumfries for Dumfries House - see Christie's op. cit., lot 20. They were invoiced at a cost of Â£36 15s and described as 'two large oval pier glasses wt. rich carv'd frames and painted white'. The third edition of Chippendale's Director published in 1762 illustrates several related designs for oval mirrors, which are variants to the offered mirrors. These include pls. CLXXIV and CLXXII, which similarly feature ho-ho birds flanking the crestings. 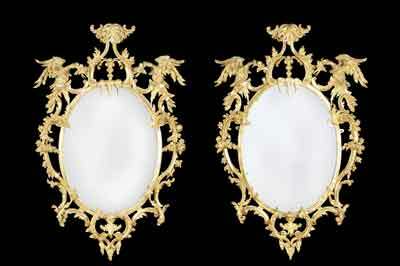 A further comparable pair of mirrors sold at Christie's London on 26 January, 2011 and a single giltwood oval mirror surmounted by carved birds, with provenance from Richard Courtenay Ltd, sold at Sotheby's, London on 25 November, 2005.